Hello curious people! As much as I always have plans to write more, it never quite works out that way. Once a month looks like it’s all I’ll be able to do for the next little while. The last few weeks have flown by with lots of things going on. 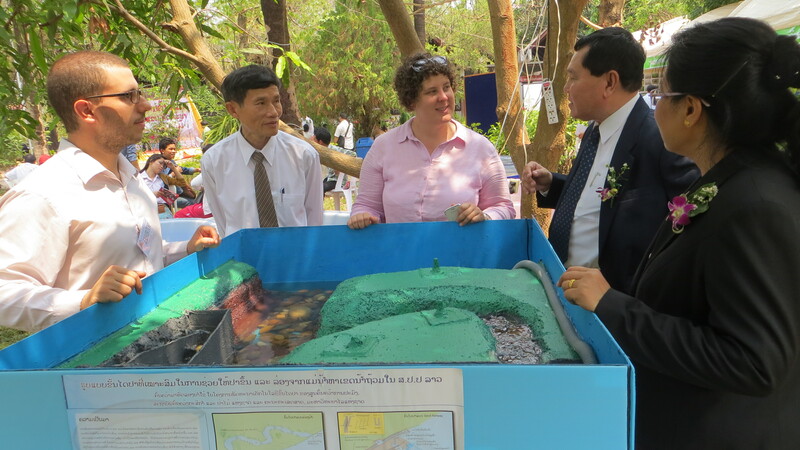 Work has been really hectic with trips to Paksan, working on the fishway model, exhibiting the model at the National Agriculture and Forestry Research Institute symposium and working from home on upcoming work in Luang Prabang. 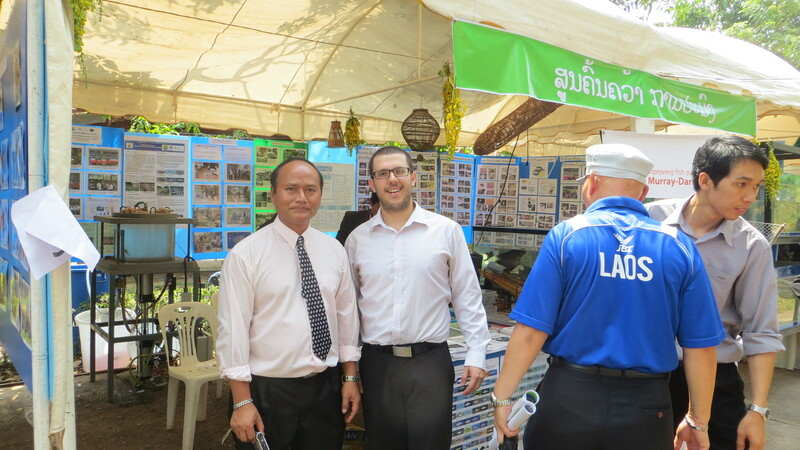 Working here in Laos has definitely been an eye-opener so far. The aid and development sector is very dynamic and confusing. It’s hard to know who the aid money and workers actually benefit. Is it the locals, struggling to make ends meet or the locals struggling to decide whether to they need an upgrade of their SUV. There’s also the aid workers themselves (myself included) leading relatively wealthy lives, sending their kinds to posh schools, hiring cleaners and gardeners to look after their every need, 7 days a week. There are definitely people here who do good and make a positive impact but it does feel that it could be done so much more efficiently and with much less fanfare. A lot of people give the excuse that everything is because of the communist government but I’m not as convinced. Yes, the government is certainly not perfect and has many issues but I don’t think they’re the cause of so many projects here failing. I don’t want to become a “typical” aid worker though. Complaining about everything. I’m super-stoked to have been given this opportunity and am loving every bit of it. One of my colleagues bought what I thought was a baby dog for his wife’s stomach as it was apparently some sort of secret Lao remedy. I promptly accepted this as fact and made a note to look it up online later on. Turns out it was in a fact some secrete Lao remedy. Not for his wife though but for his baby dog. Glad that one was cleared up before I made too many judgments. Language barrier wins again. 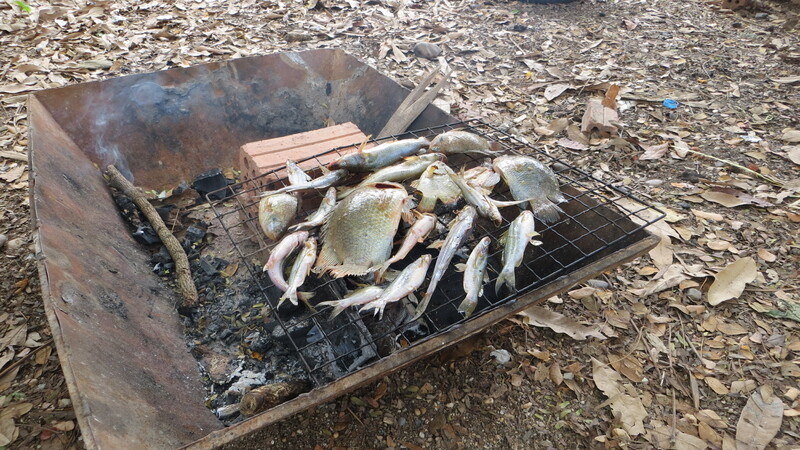 Had a fish bbq at Pak Peung village. The fish was really fresh. 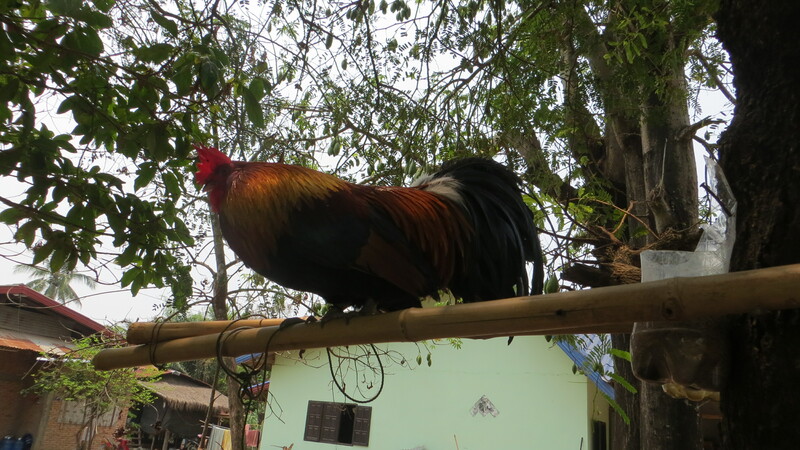 In fact it was still jumping after having lemon grass stalks stuck down its throat and placed on the grill. Lao people love beer and they like to start you on it early. I’ve seen toddlers given a glass. We saw a snake at the work site. The workers promptly split the snake in half (almost) and buried it alive. Slightly different to ecological practices in Australia but much more entertaining. Calling roosters stuck in the trees all day with minimal water and food. Occasionally falling down and dangling from the string that keeps them tied there. Many highs and lows. The locals tend to throw rubbish down everywhere. As soon as a bottle or plastic bag have been used, they get tossed into a rough pile to be burned later on. 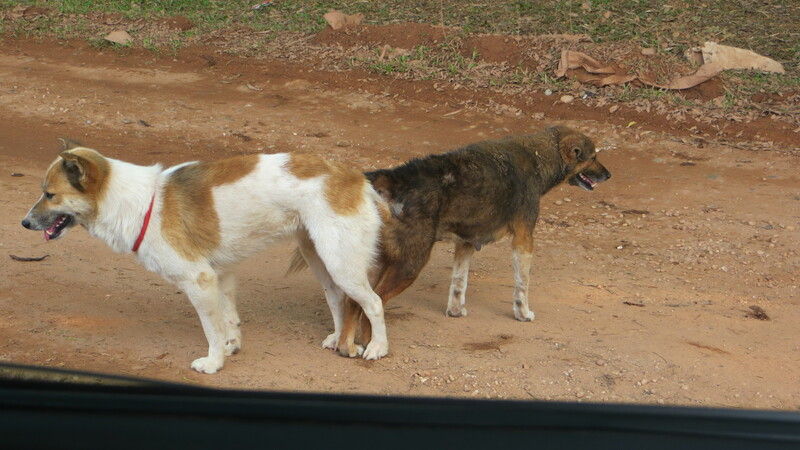 This will show my ignorance but I honestly thought these were some weird Lao conjoined dogs. If you’d like to know why this happens then you can find out here. Well, that’s it from me for now. Liz and I are off to Thailand in a couple hours for a 2-week holiday. 1 week in the city and 1 week at the beach should be a nice break from the grind. P.S. I’m half-way through my placement here which means that people back home should start planning/organising a ‘welcome home’ party.